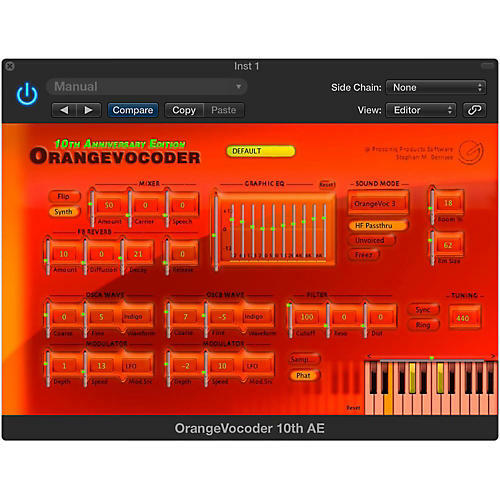 Heard on countless songs in multiple genres worldwide, ORANGE VOCODER AU is indeed a classic software vocoder plug-in. Originally developed by Prosoniq in 1998, ORANGE VOCODER has since evolved through numerous iterations, always staying at the cutting edge right to this day. It has a reputation for being the single most transparent sounding and flexible vocoder plug-in available...and the team at Zynaptiq agrees. Intelligibility is key when transforming speech using a vocoder. Which is something that ORANGE VOCODER excels at. Apart from its unique, highly transparent algorithms, it also features a high frequency pass-through circuit as well as voiced/unvoiced detection. On the other hand, ORANGE VOCODER has several options to make the results more diffuse, or even static - the integrated Filterbank Reverb allows smoothing and blurring the Filterbank modulation, while the Freeze function will capture the current state of the Filterbank and hold it infinitely.